The internet offers opportunities for self-expression and most of the people do agree to put forth their opinions of the subject they are interested through these social websites. Besides keeping in touch with friends or relatives, it also offers a medium of exchanging information that is needed for carrying out many changes in society. Lets face it, people including employers do take their time to snoop in to the social media websites to get to know more about the personality or nature of the person they are going to hire. Having a look into the comments and the likes they contribute show their nature and their interest. Sometimes this could be regarded as trait that you possess which would not be visualized in the resume you have sent. A short interview may not give the full picture of your nature and your recruitment could solely depend by reviewing the contents on Facebook!! 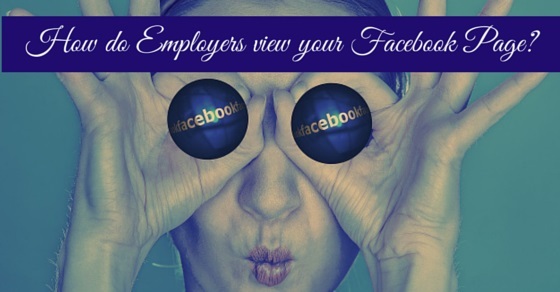 So what Employers are thinking when they look at your Facebook Page? Aren’t you inquisitive? Get to know some of the typical characteristic features they are looking out for after having a look at the photos available for public viewing, updates on status, conversations, wall postings, information shared, etc. Getting involved in group discussions or sharing comments in groups would show how much is your involvement in group work. Also could emphasize your team work ability. So take time to connect with group work and see that you associate with groups especially professional groups. Sharing information for others or getting involved in social activities through this site would only show your helping tendency. It could be for donation of blood for operation or passing on information for finding someone is considered as some of good qualities. This could be easily identified when you are connected indirectly to your friend’s network. Making yourself getting connected with others identifies your socializing nature. Employers would love to see their employees as person who befriends others and get their work done. This part is always what all are interested in knowing. There must be clear demarcation between sharing good notes and sharing for the sake of fun. At times it could lead to heated exchange. But your nature of taking things easy and having fun will make an employer feel that you are easy go nature person. So why not have fun in the right way. Writing up correct information has a lot to tell about how you work. Being able to not only write the information but also share or post apt contents brings out your working style and this is sure to catch the eye of the reader. From the intensity of the contents you could make out that you take the matter seriously and investigate more about it before putting out your comments. This nature depicts that you work hard to achieve your aim. From the way the contents are written or the depth of the information it shows how much you take care to make your information clear and to the point. An employer would be able to understand that you take care to excel in whatever you are assigned. Making your views on the related subject shows your dislike for it. From the use of appropriate words or sentences you make yourself obvious of your dislikes. But care must be taken not to use very abusive language as it would only show that you would not hesitate to use them at your work space. Internet being a wide array of information brings out the exposure of person to new ideas. Facebook is just one medium where new ideas can be talked about and being a part of it will only show that you share ideas. Most of employers always look out to see if the individual has creativity and definitely you will be sought after person. Participating in discussions also will determine your personality. But it should be good philosophical topics rather than day to day rumors. It shows whether you take to gossiping or not. Hence, take care while participating in discussions which should cater to knowledge sharing one. There are certain features that you might possess. One could be that you respond to people or friends sharing or comments. It means that you are prepared with thoughts or answers that make you unique in your approach. Having said so, your nature of gathering information before speaking is also one unique quality. Having a way of presenting oneself or sharing a thoughtful quote brings out the uniqueness in you. Employers are interested in getting uniqueness that means breaking down the monotony. Being able to do your work in your style is what employers would be interested in as your mind is being able to create new concepts. By making remarks appropriately it would tell about your attitude of perceiving things. Making inappropriate comments or trying to respond immediately shows that you are haste in response. Such nature would be discouraged as you would take decisions in haste and not analyse beforehand. Do never be in haste and reply promptly. Making your presence in worlds changing scenario would only show that you accept changes and adapt yourself to the trend. It also shows that you make changes to yourself by adopting the changes into your world. You have an eye to open up to the changes. It is inevitable in today’s world where changes is the name of the game. Your involvement in such issues will make the employer feel that you can mould yourself to the trend and progress within the group. It is also a platform to see how well you are in using the right grammar or even how well is your written work. It is important to be appropriate in using words right to the context and mind the language you are using. Using inappropriate words would also show how your level of calibre is. So take care when writing comments on Facebook. Being cautious when posting remarks will help to keep your profile in appropriate level. After all the type of remarks you post determines your thinking skills and your ability to communicate well. Never make silly remarks and always show appreciation in your comments. Employers sometimes would decide your leadership qualities through this gesture. Be careful in what pictures you post as it could also jeopardise your potential to get a job. Better to post pictures that you are informal dress rather than in a beach resort. Your attire decides your nature and character. Hence, try to post pictures of you in best attire. You may be associated with certain groups of your choice depending on your habits or nature. Even this could determine your underlying characteristics that could motivate an employer to know about your interests. This could pave way for future assignments that they are thinking about. Many of the Facebook users are keen on updating their statuses wherever they are. It only shows that want to keep connected with the world they believe in – their network. Keeping updates is a key feature that employers would be interested in as it shows that you keep yourself abreast of the upcoming trends and willing to accept the changes. So you can see that sometimes Facebook could be used as tool to understand your characteristics nature and what do you excel in. A few years back Facebook was only a medium for teens to get connected with their counterparts, but now even elderly keep in touch with their friends and siblings including their grandchildren. As depending on the privacy settings, it is still having open access to potential employers as well. Perceptions are also one way to know about the inner side of an individual’s nature and help to decide who they are. Now having reviewed them, it’s time for you to know how to keep your profiles clean and groomed so that you are always preferred during job prospects or any career changes that you may envisage in the future.